Four attractions. One ticket price. 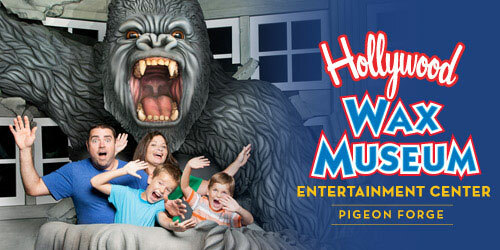 It’s the best entertainment value in Pigeon Forge and fun for everyone! Pose with the stars at the Hollywood Wax Museum. Find out if you are the chosen one at Hannah’s Maze of Mirrors. Join the battle against evil at Castle of Chaos. Survive a zombie infestation at Outbreak – Dread the Undead. FREE visit to VIP Observation Deck (weather permitting) with this special! Open 365 days a year. Use coupon code 4002.